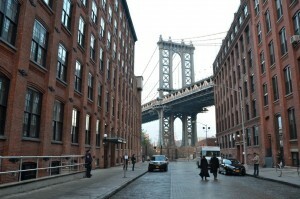 When artists began taking over the large loft spaces in this tiny riverfront corner of the city in the 1970s, they wanted to dissuade gentrification, so they gave the area a name they thought no one would want to say they live in – Dumbo, an acronym for Down Under the Manhattan Bridge Overpass. Not even the rumbling of the trains on that overpass could hold back the influx of people who appreciate the Old World charm of the rehabbed manufacturing buildings and warehouses along the cobblestone streets of this intimate, somewhat isolated enclave of only a few square blocks with its magnificent views of the Brooklyn Bridge and Manhattan. The pedestrian-friendly streets are dotted with quirky shops and cool spaces. Powerhouse Arena is not only a bookshop and home to an art book publisher, but also a gallery, a boutique, and a performance and events space. Independent music shop Halcyon specializes in marginally popular music styles mostly on vinyl and also operates as a listening den. Local up-and-coming fashion and jewelry designers’ wares are featured at Trunk. Online artisan marketplace Etsy is headquartered in an old carton factory and hosts an array of crafting workshops and tech lectures. St. Ann’s Warehouse presents innovative and highly influential theater and concerts. Brooklyn Bridge Park, extending south into Brooklyn Heights along the East River, is the green jewel of the waterfront. Highlights of the park include the oversized, glass-enclosed antique Jane’s Carousel, which is enjoyed regularly by kids of all ages, a sand beach, a marina, walking and biking paths, and plenty of grass and play fields which also host concerts and outdoor film screenings. In this close-knit and creative neighborhood, there’s always something going on. Sprinkled among the unique loft spaces that abound in Dumbo are some newer high-rises with full amenities and breathtaking views. Its proximity to Manhattan as well as its unique feel and waterfront siting create a demand that is reflected in the relatively high prices. Creatives and families co-exist here easily as both were attracted by the same quirky features of the neighborhood.